HideMyAss VPN is a company based in the United Kingdom, which is not as challenging as the US with the data retention law; still, there are some limitations that the VPN service provider needs to overcome – since most VPN users value their privacy a great deal and would do anything for that. The numbers are astonishing: 940 VPN servers in 330 locations in 190 countries, handing over 120000 IP addresses – and their network is still expanding. We are going to focus mainly on the Android app that HMA VPN offers to the subscribers. This will highlight whether or not the users that aim to get high quality Android VPN are going to be disappointed – so, let’s get started with our HMA VPN review on Androids! First of all, the Android app for HideMyAss is available at Google Play store. No extra fee is necessary, though you get it that you have to be a subscriber to HMA for being able to use the app. The interface is quite simple and easy to use. The colors that have been used are none others than the ones that you will find on their website, with yellow and light green stealing the show, along with the classic white and the logo with the donkey. If you are interested in how to use the Android app, you can have a look at their detailed guide here. You can connect with a simple button and have the preferred VPN servers of yours added to your favorites (by clicking on the star next to them). You can choose to connect to the VPN upon launch or on startup or finally keep VPN always connected and you can see the exact location of each server, with the IP address that has been given to you. From the app, you can contact support and you can see how many days are left till your subscription’s expiration date. No speed test is available right from the app, though. OpenVPN as the most secured and trustworthy security protocol is supported, which is great. As we have highlighted before, HideMyAss VPN has got an impressive network of VPN servers for you to choose from. Other than that, the advanced encryption options of security protocols like OpenVPN, LLTP and L2TP are enabled (with OpenVPN being the number one choice for Android users – and any other user who values encryption). Upon subscription, you get the opportunity to use the VPN simultaneously on two devices. This means that you can have your Android running smartphone and your laptop on at the same time and not compromise security on any of those devices. Free proxies and a plethora of plugins (for instance, the Panic Button or the IP Checker) can also come in handy to VPN users. As you must have noticed, the Android app is simple and there is no complicated process in the setup or the use of special features. A negative aspect is the lack of Kill Switch, which could prevent data leaks. Another thing that you ought to consider is the fact that they do keep some logs and that there has been precedent with data handed over to the authorities from HMA. Depending on the duration of your subscription, HideMyAss VPN can be proven exceptionally affordable. There is a current discount available due to summer sales. So, the price rates include the cost of $11.52 for a monthly subscription, $8.33 per month for the semi-annual plan and $6.55 per month – as long as you subscribe for a whole year. 30 days full money refund guarantee is an added bonus. No free trial is offered, though; with prices like these and with the gracious monthly full refund guarantee, this is not something that should worry you. As for the payment methods, you have many different options. You can use a credit card or go for PayPal, Bitcoin or wire transfer. Of course, Bitcoin is the ultimate anonymous option and we would recommend that in a heartbeat. Moving on to the support department of HMA VPN, there are many options for you to keep in mind and select from. Of course, on the website your eye gets immediately caught by the chat at the bottom right side of the screen. You can contact a representative without any delay from there. Since we are interested in the Android app mostly, you can send out a ticket or get to the knowledgebase from the app. This can be really helpful, especially if you are in the middle of an emergency. Besides the rich social media alternatives (with accounts on Facebook, Twitter and so on), there are also the setup guides and the forum or the blog that you can use. The choice is yours to make – but we would suggest using the chat for instant feedback! 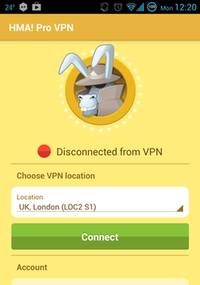 After having analyzed the Android app for HideMyAss VPN and after having looked at the various aspects of their service, we are ready to highlight both the advantages and disadvantages of this choice. First and foremost, HMA VPN is based in the United Kingdom and there have been some incidents in the past with the data logs kept. However, should you overcome such a potential barrier, the network of their servers is amazing and it is continuously expanding. Their Android app is modern with fresh and vivid colors and with easy setup. Although there are not many eye-catching features that could impress us even further, the performance is solid and the ease of use is indisputable. The support is great and can be accessed easily via the app. The affordability is wonderful and particularly with the seasonal sales. Flexible payment methods and a whole month guaranteed with full money refund complete the offering of HMA VPN. If you are looking for an inexpensive and simple Android app for your VPN connections (without worrying too much about the logs), HMA can really help you out!